Facebook Exchange regarding the mystery of the Salisbury Chemical weapons attack and the subsequent withdrawal of diplomats from Moscow, and the removal of Russian Embassy staff from many nations in a united stand with the UK. Interesting isn’t it Chris? The government can convince NATO and most of the EU with “compelling evidence” yet they cannot provide any of that evidence to the UK public or to Russia. Funny how our nation quotes United Nations when it wants to. I’m near a bar and the conversation is about Porton Down while Sky Tv news talks to itself. The general consensus is that the News media isn’t being clean. 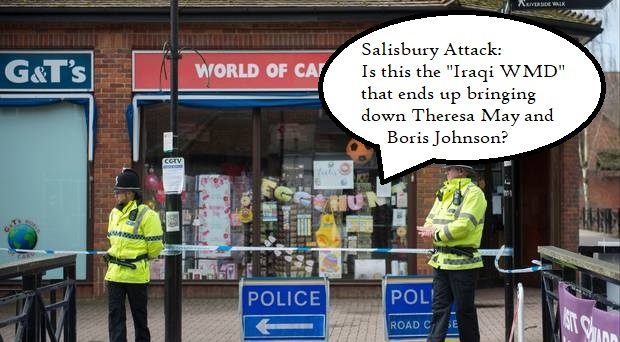 Nobody at any time has proved to the British public that Russia was involved with Salisbury. No mention of this by the spokesman. Now rogue elements could have diverted some of Russia’s stock maybe, or equally those three countries could have rogue elements or even purposed agents. I don’t see how any UK media can say with certainty that it was Putin and main Russia. At this stage I had only read an article two weeks ago talking about the OPCW which was slightly different from the article below. The News last night actually reported that the OPCW were refusing to believe UK's accusation against Russia. Nice to be two weeks ahead of UK media!! !